Our simple yet informative guide to the Autosleeper Talent, Trident, Trooper, Trophy and Topaz VW camper conversions should help when understanding the model differences. Auto-sleepers, which is the less used but correct spelling of the company name, is a long established convertor and has been building well respected and high quality VW based camper conversions since 1961. Fixtures, fittings and upholstery are both durable and comfortable and with the T5 VW camper range became increasingly stylish. We buy Autosleeper Talent, Trident, Trooper, Trophy and Topaz campervans, so if you have one to sell please get in touch by calling 0121 453 4577 or by using our online valuation form. 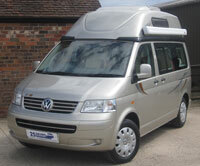 View our current stock of Autosleeper Campers for sale.